Powers: Kublai Khan possessed no superhuman abilities, but was a brilliant scientist. History: Kublai Khan was an Asian criminal mastermind, possessing advanced technology, a flying headquarters named 'Xanadu', and a legion of followers. However, while his statues portrayed him as a handsome warrior, he was, in fact, an obese man with limited mobility. 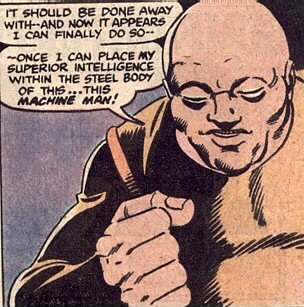 (Machine Man I#10 - BTS) - Learning of the robotic life-form Machine Man, Kublai Khan created an artificial earthquake in an attempt to destroy him. 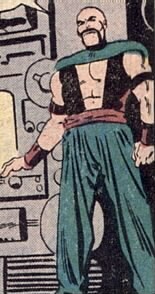 (Machine Man I#11) - The thief known as the Binary Bug approached Kublai aboard Xanadu with the intent of stealing his valuables, but Khan's wealth was saved by the arrival of Machine Man. In the course of their battle, the Binary Bug accidentally killed himself. Khan resolved that somehow he would make Machine Man his. (Machine Man I#13) - Khan set a trap for Machine Man in the elevator shaft of a building. Impressed at how easily Machine Man avoided being crushed by the elevator car, Khan became convinced that he should capture him, and enter into his body, so that at last, he would have a body to match his mind. He had all his agents sent to guard the building killed with explosive devices planted in their necks. Contacting Machine Man, Kublai threatened to destroy him with a sonic blast unless he did as he commanded. Khan lured him to a junkyard, and sent a wrecking ball and laser-equipped flying cars against him. Defeating all of these, Khan sent Machine Man to a laser-guarded maze, which he easily escaped from. 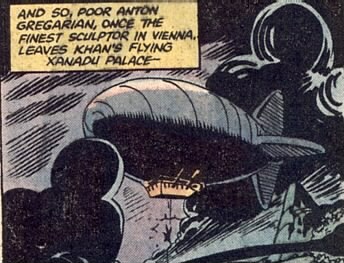 Now certain of Machine Man's greatness, Khan directed him to Xanadu, where Tong defeated him in combat. They then attached Machine Man to a device designed to transfer Khan and Machine Man's consciousnesses. It seemed at first to work, but Machine Man was only pretending to be Khan to trick Tong. As he and Tong grappled, Tong was smashed into a computer panel, starting a fire. While Machine Man fled, Kublai Khan lay immobile upon a table, crying for aid, and receiving none, cursing Machine Man, and promising to return from the grave. Minutes later, Xanadu exploded. Comments: Created by Marv Wolfman and Steve Ditko. A very Steve Ditko story if I ever read one. Objectivism to the extreme! Tong was Kublai Khan's most faithful servant, unable to feel pain due to the removal of his nerve endings. Tong oversaw the attempt to place his master's mind into Machine Man's body. Tong was apparently slain when Xanadu was destroyed. Xanadu was the dirigible headquarters of Kublai Khan, from which he oversaw his plans. It was equipped with advanced scientific equipment, and a veritable army of followers. After catching on fire during Machine Man's battle with Tong, it fell from the sky in flames before you could say "Hindenberg".